This year's solar eclipse was the longest of the century. At maximum eclipse out in the mid-Pacific it was ~ 6m40s long. 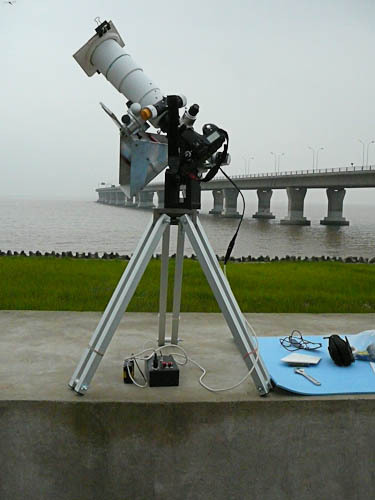 At our prime site, Dishui Lake, south of Shanghai, the duration was 5m 45s. For most eclipses the challenge is in getting to the path of totality in remote areas. This year, the challenge wasn't getting there. All we had to do was get off the plane in Shanghai and take our bags off the carousel. Our big problem was the possibility that we may be clouded out. 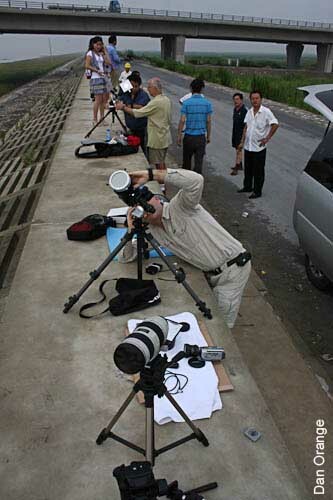 Bengt Alfredsson is the groups most experienced eclipse chaser with 10 solar and 2 annular eclipses behind him. Joe has observed 6 total and 2 annular eclipses since 1994. This is the fifth eclipse Bengt and Joe will have attempted together. Greg Bond and Joe have been friends for about 30 years. Greg is a very experienced astronomer / astrophotographer but this is his first TSE. making a HD video with his SONY HD video camera with a Marexar fisheye adaptor. Ryo Kato recently joined the eclipse group as the 4th member. Ryo is Japanese by birth and now lives in Germany works in IT. He has seen 4 eclipses. 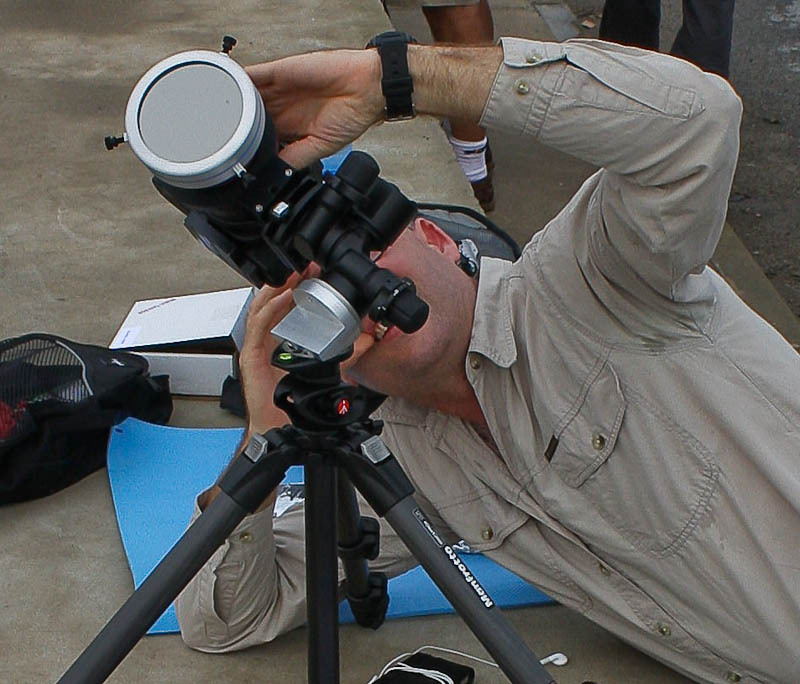 using a William Optics 70 f6.2 APO on a Skywatcher EQ3 mount. a start-up independent oil and gas company located in Jakarta. Dan was be the last person to join our eclipse group. This is Dan's first total solar eclipse so he plans to enjoy it and take a few pictures with his DSLR camera. He has wanted to see a solar eclipse ever since a friend from Grad School went to Baja for the 1991 eclipse and raved about it. He will finally see one weather permitting 18 years, 11days and 8 hours after his friend. making an SD video with his JVC video camera with a wide angle adaptor. 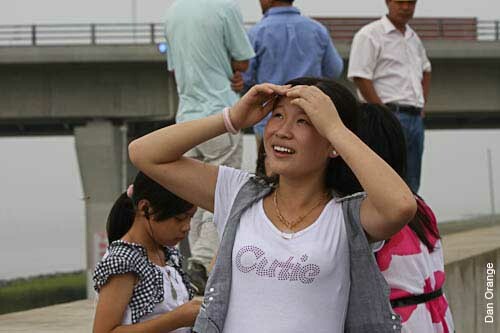 To cut a long story short, we were basically clouded out at the north end of the Donghai Bridge. We surveyed several sites but in the end, we flipped a coin between two sites. One, 5km north of the bridge and another right under the bridge. We chose the southern location right under the bridge. A clearing reached us just as totality ended so with hindsight we should probably have chosen the northern site but that was no guarantee of success because we don't know the exact nature of the cloud opening we saw. 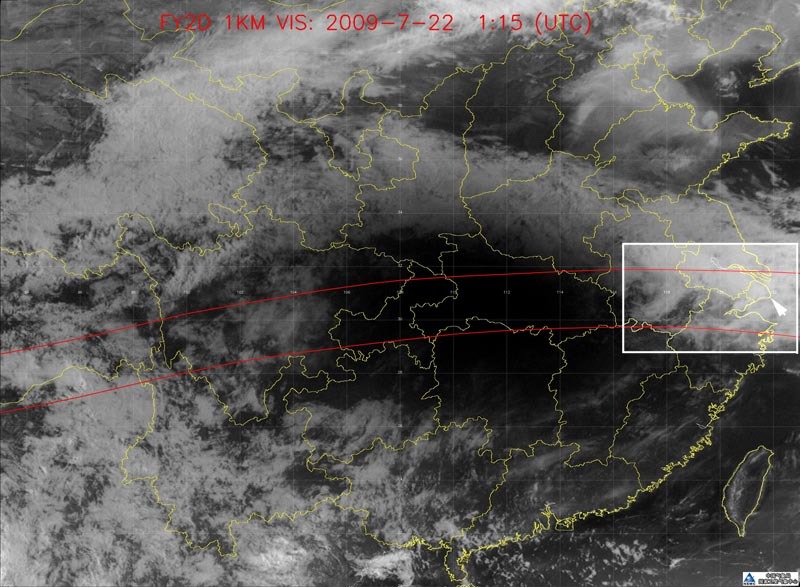 It was through multiple levels of cloud so being further north holds no guarantee of cloud breaking open any earlier. 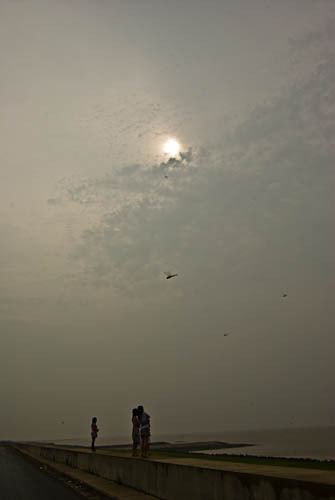 Even if we had got the opening, seeing inner corona only through thin cloud still doesn't count as success in my books. For my money, the sky between the observer and the corona has to be cloud free at least for some of the duration so that the outer corona can be enjoyed. This is particularly so at a solar minimum eclipse. The rest of this report covers the failed expedition, some of the instrumentation used by different members of the group and a new technique for polar alignment at solar eclipses that I devised. 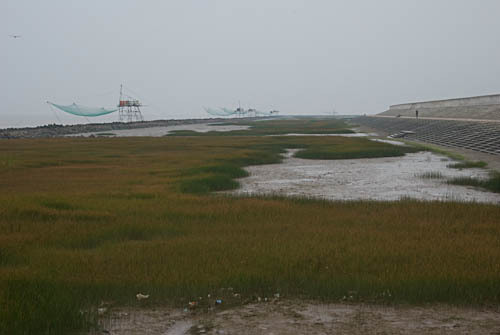 Our prime site Dishui Lake is located 65km SSE of Shanghai. Leaving downtown Shanghai around sunrise travel time is about an hour. Bengt and I surveyed the site about 10 days before the eclipse. After a year of staring at Google Earth images it was good to see the site in the flesh. During the survey session, I noted that the compass was wandering a lot as I moved towards and away from the sea wall. 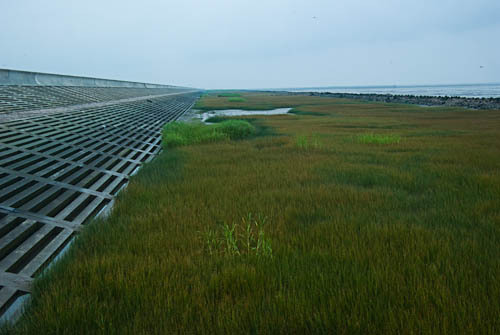 The sea wall, designed to withstand typhoon storm surges and massive seas. I guessed that it contained a lot of steel reinforcing and thins was responsible for the variation. Yet the wall was going to make viewing and working so convenient. We had to find a work around for the polar alignment. Enter Google Earth(GE). 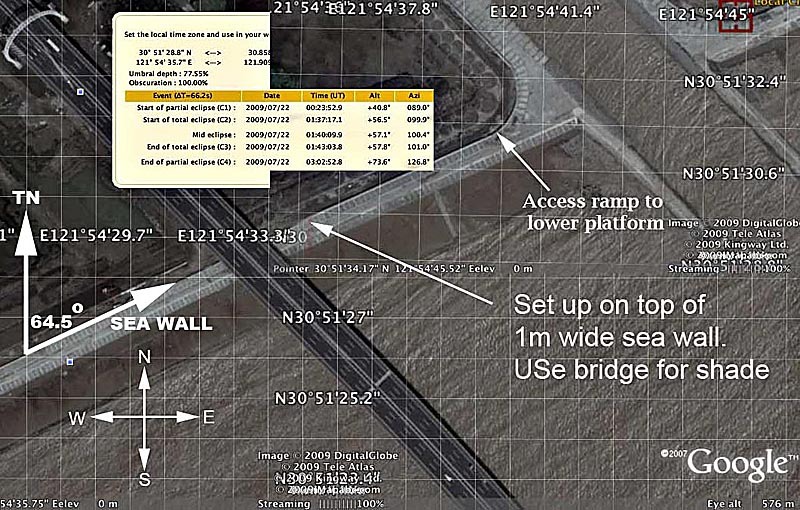 Using GE I determined that the wall runs 64.5 degrees east of north. I designed a jig that eliminated the use of compass altogether. 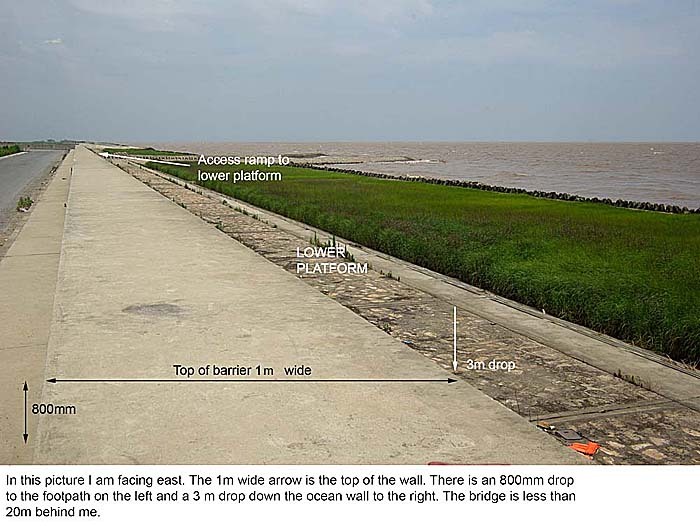 By aligning the right edge with the polar axis and the top edge with the sea wall, the mount would point true north. I drew it up in a drafting program on my laptop and emailed it back to Greg who was still in Australia. Greg had access at home to cutters and straight edges to cut the jig accurately. Bengt and I hired a minivan that seats up to 7 pax. We limited participants to 5 to allow space for equipment and fast response if we had to pick up and move to avoid scattered cloud at the last minute. We spent Tuesday 21st preparing equipment. 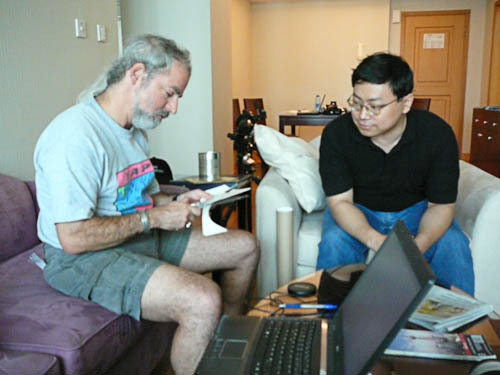 I was more or less already prepared because I had planned to attend the Intersoles meeting in Pudong that day. Unfortunately, two days earlier I stepped in a hole walking down a street in Suzhou at night and sprained my ankle quite badly. So I was content to monitor weather and rest the ankle. Eclipse central was a large apartment we rented in Shanghai. With three bedrooms and a large living area it gave us plenty of space to spread out and work in airconditioned comfort and at a fraction of the cost of a stay at a hotel of similar standard. Ryo and Dan rented smaller apartments in the same complex but did much of their preparation in our apartment. Photo's Top left, lower right Ryo helps Dan make a solar filter for Dan's camera. Top right, lower left Ryo sets up his Eclipse Orchestrator scripts while Bengt conducts a dry run with his tracking arm camera also controlled by Orchstrator. 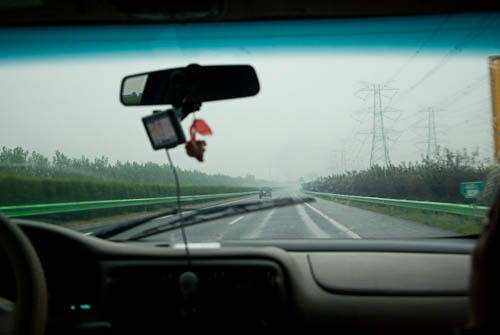 We left Shanghai at 5am and headed down the A2 south of Shanghai. It was raining intermittently. From left to right, Bleary eyes & wry smiles all round. 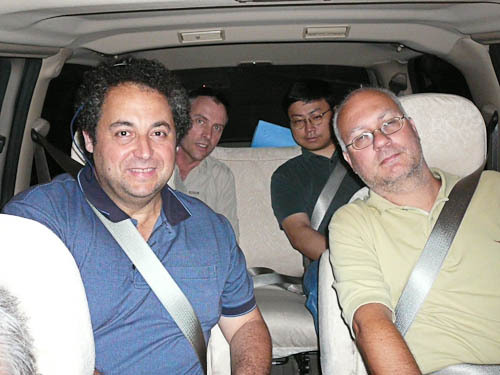 Joe Cali, Greg Bond, Ryo Kato and Bengt Alfredsson in the car on the way to Dishui. Photo Dan Orange. We stopped at the northern site that we dubbed site 3 to take a look around before driving south for the bridge at site 1. 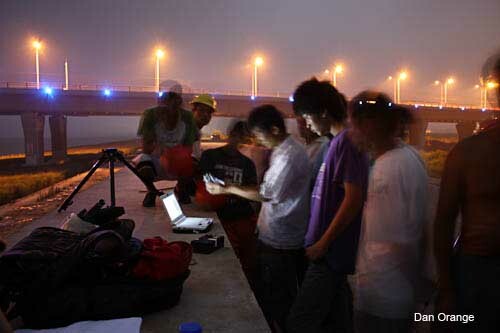 At site 1, we set up our equipment on the sea wall. The wall was 1.2m wide and a bit less than waist high. It allowed us to set up our gear on the wall with tripod legs compressed yet we were able to sit on the wall or stand comfortably at the equipment to look through it. The EQ users Ryo, Bengt, Greg and I set up EQ mounts using the polar alignment jig. Did I say too easy? Unfortunately, the drawing I sent Greg was not as clearly marked as the drawing shown above. In the field, all the EQ mount users had difficulty using it. Greg is a very experienced astrophotographer and much more practiced at polar alignment than I am. When Greg had trouble, I knew something was very wrong. When I went to use it, I had trouble too. The angles were correct, the problem was the markings were misleading or ambiguous. I initially pointed the mounting 120 degrees off by using the east side of the mounts. This was however soon obvious. Once I got my head around the problem, I was able to set up all 4 equatorial devices belonging to Greg, Ryo, Bengt and I to north in under 5 mins for all of them. Knowing the potential problem. I don’t think I will ever make this error again. 2. being able to make the jig before you go or soon after you arrive. With access to wireless internet becoming so readily available, I can forsee the method being easier to use in the field for future eclipses. In the future, I might use a different adjustable jig that can be set with a protractor on site. A tale of two telescopes and other equipment. 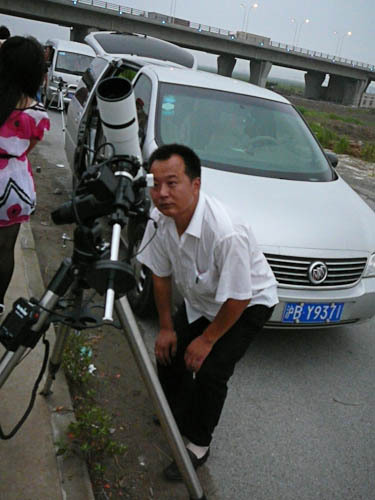 There were two telescopes on site, one belonged to Ryo Kato the other was mine. Both had the same OTA but the mountings could not have been more different. The picture above is my home made lightweight equatorial. The tripod, single arm fork EQ head and controller weigh 4.5kg. The dominant design parameter was minimization of weight therefore counterweights needed to be eliminated. The polar face of the fork arm has milled slots on the attachment bolts to the polar flange so that I can slide it transverse to the polar axis to allow for payload balancing without the need for any counterweights. Once set for a payload it can be left in that position until the OTA configuration is changed. I make a fixed angle wedge out of wood before each eclipse. This is much lighter if less convenient than having a variable adjustment polar angle setting. I can also make up to 5 degrees of adjustments to angles using the legs which tilt independently to allow for a change of observing location. The OTA is a William Optics 70mm f6.2 APO. I've fitted it with a flip mirror box to switch the optical path between an eyepiece and DSLR camera. I chose this eyepiece for eclipse work and will continue to use it. It is a University Optics Konig 16mm that gives me a 2.4 degree field of view with 26x magnification. I custom machined a parfocalizer tube for that particular eyepiece so that camera and eyepiece are precisely parfocalized. This mounting has been under development since the 2001 TSE in Africa. I am basically pretty happy with it now. My checked luggage weight this year was 20.7kg and my hand luggage was within normal limits. I will eventually write a more detailed and better illustrated article about the mount. Ryo Kato's Skywatcher EQ3 mount carrying a William Optics 70mm f6.2 APO. Ths is an off the shelf model. Ryo has managed to find a way to transport this solid little mounting on aircraft. Ryo made sure he used an airline that had a 30kg luggage allowance so that he could transport the scope. His mounting is much more rigid than mine and far less prone to vibration. If the wind blows hard, I am in trouble, he might be OK. I am gambling on the fact that even if strong wind was present before an eclipse, it usually dies out before totality. During our discussions about telescopes and mountings Ryo did say that it was a bit too heavy to fly around with and he needed to find ways to cut down the weight. Greg and I had on nuerous occasions discussed the modification of this type of mount. Greg suggested he replace the extendable steel legs with short single section aluminium legs as a first step. Then removing the dec axis and replacing it with something similar to mine that eliminated the heavy dec axis, housing, motor and counterweights. Below : Dan was using a Canon 70-200mmf2.8L, Greg a 200mmf2.8L both with D40's. Greg's camera was mounted on the Manfrotto worm geared 3 axis head. He custom machined an equatorial wedge from aluminium to tilt the head turning it into a manually driven equatorial mount. The wedge is just visible near his right hand. More detail below. Behind the two tripod mounted Canon cameras, Bengt Alfredsson was using a Nikon 180f2.8 with a 300D body. 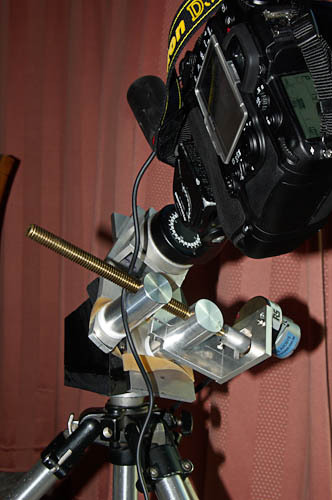 Camera was mounted on a prototype tracking arm built by Joe Cali. It was completed only one day before departure Had we seen the eclipse, it would have worked well enough to image but some design problems were identified in this field test. We hope to have it working better for future eclipses. The tracker is an equatorial 'syngent' drive arm, similar to a tangent drive but the mathematical function of the error curve for this mechanical design is sinusoidal not tangential. The tracker arm itself with controller weighs in at 1.5kg (tripod not included). I hope to reduce this to 1.2kg. It will easily hold my William Optic 70mm f6.2 OTA with mirror flip box, eyepiece and DSLR camera(3.5kg payload). It easily holds Bengt's Nikon 300D with 180mmf2.8 lens. I think it would probably hold any short OTA up to a 4" cass or Maksutov or refractors up to 80mm diameter and up to 400-500mm focal length. Longer OTA's will put too much strain on the tripod head holding it. For smaller camera/lens combinations, you could use a ball and socket smaller & lighter than the Manfrotto 141 head we used. 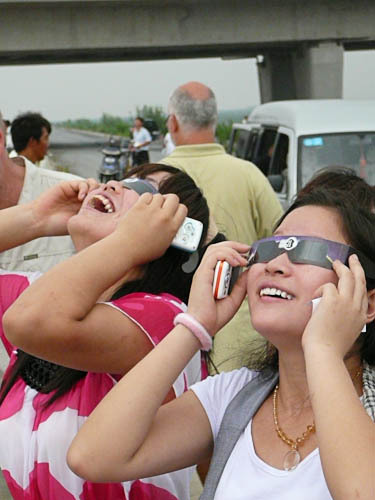 Its design was based on the question, "What is the minimum tracking precision required to accurately photograph a solar eclipse with a small telescope or lens?" The answer is a range of solutions to a compicated multi-variable problem but basically for most small fast optical systems, the drive only has to keep the image roughly centred for about two hours and be accurate enough to allow an unguided exposure at mid-eclipse of between 1/2s - 8s depending on the optics used. The radius arm on the tracker has plenty of torque for heavy radial loads but without the bulk of a full worm drive. A complete description will appear on this site when the tracker is completed. We plan to make two more, one for me and one for a friend who is an expert engineer/machinist who is also involved with the design and construction. I didn't get a close up of the tracker at the eclipse site but here is a photo taken at the apartment. 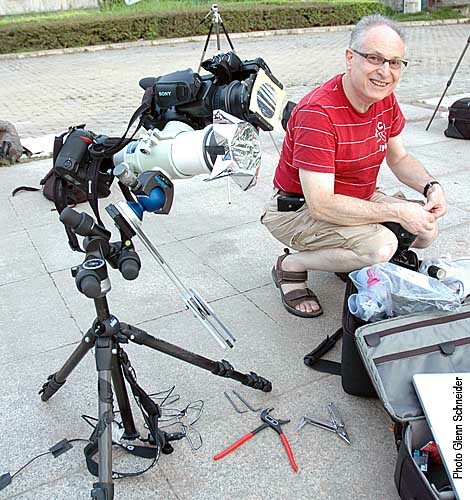 Greg Bond was using a Manfrotto 055c carbon fibre tripod with the Manfrotto worm geared head. Between the tripod and head, Greg machined a small aluminium equatorial wedge to turn the tripod into a small manually driven equatorial mount. The head is quite solid and rigidly held the 200mm telephoto lens. It's always interesting to contrast the way different people utilize similar equipment. I found this picture of Joel Moskowitz on Glenn Schneider's site. 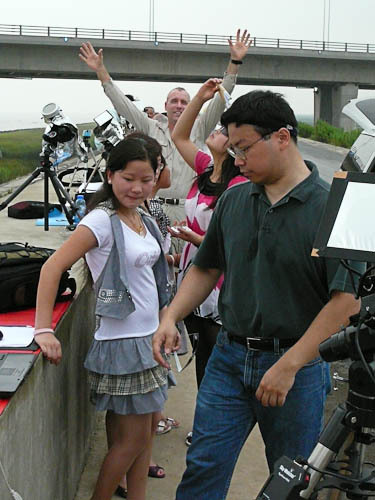 Joel (in Wuhan not at our site) was using some of the same basic mounting gear as Greg Bond but in an entirely different way. Joel has used the same Manfrotto carbon fibre 055c tripod and geared head. But unlike Greg who used the geared head as his eq head, Joel is using the geared head as an equatorial wedge. Joel then has an Astrotrac TT to track the Sun and a very substantial ball head to rigidly support the heavy payload. Joel was using a Sky 90 FL=500mm and needed motorized tracking while Greg was using a 200mm telephoto and he was willing to manually track using the Manfrotto gear head. Each had different travel objectives. Greg, Bengt and I went traveling post eclipse. I haven't checked but Joel was probably only there for the eclipse. Just comparing mounting components alone, Joel's photo mounting equipment probably weighed 2kg more than Greg's. For new eclipse chasers reading this passage, it is a very good lesson in bringing just what you need. With longer focal lengths, Joel needed better tracking and has a setup to match. Using a 200mm lens, Greg didn't need the tracking so he didn't weigh himself down with unnecessary gear. Optimize your equipment to the required task. The tracking arm I built for Bengt weighs exactly the same as the Astrotrac (1.4kg). But my arm uses a strong lightweight wooden wedge to set the equatorial angle, I make them from wood before each eclipse at the correct angle for the observing location. 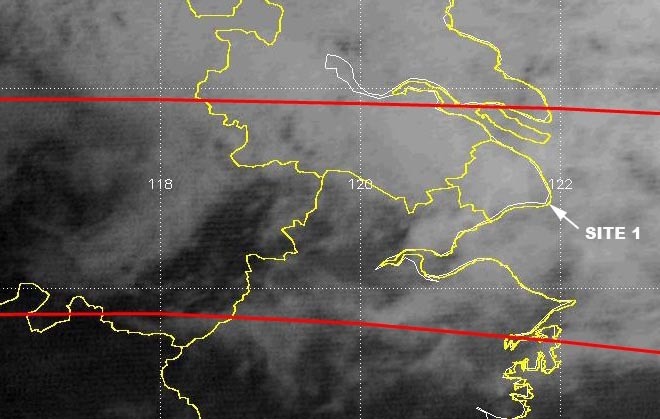 Even if I have to move to avoid cloud it is rarely going to be more than a couple of degrees of latitude and it has enough adjustment for that. Joel could basically save almost the entire weight of the geared head from his kit by using a lightweight wedge. Of course this might not be important to him but it might be to someone else wanting to put a similar kit together and save some weight. The tracking of my arm isn't perfect but it's good enough for exposures up to 8s - all that's required for a solar eclipse and can be made from components costing 1/10th the price of the Astrotrac. USD1400 is a lot to spend on something that you only use for a couple of minutes every couple of years. Different if you want to use it for other applications. There are other ways to save weight. Note the multigrips and leatherman tool that Joel uses. These two tools probably weigh 500 grams. For the telescope mount I've designed, the only tools required for field assembly are a small 100mm shift spanner and a 3mm and a 5mm allen key. In addition, I carry one small jewellers screwdriver and 1.5mm and 2mm allen keys to make fine adjustments to the drive system but these weigh almost nothing. The tracker arm has been similarly designed but we did need a 150mm shift spanner this year to do up one bolt on the tracker arm. Before it is next used, I will either mill a lightweight wrench out of thin steel or else braze side pins into the nut so that it can be tightened by hand. 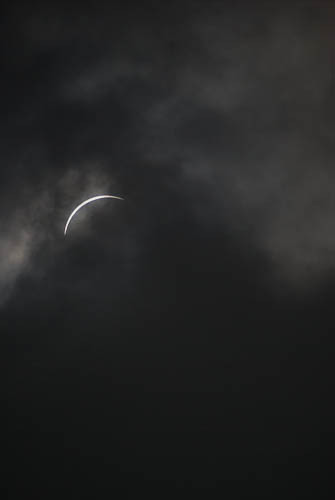 It looked like it was going to clear, the sun became visible through cloud about 40 mins before totality. But then thicker cloud came through and obscured it. The cloud cleared right at the end of totality as if Huey was blowing us a great big raspberry. 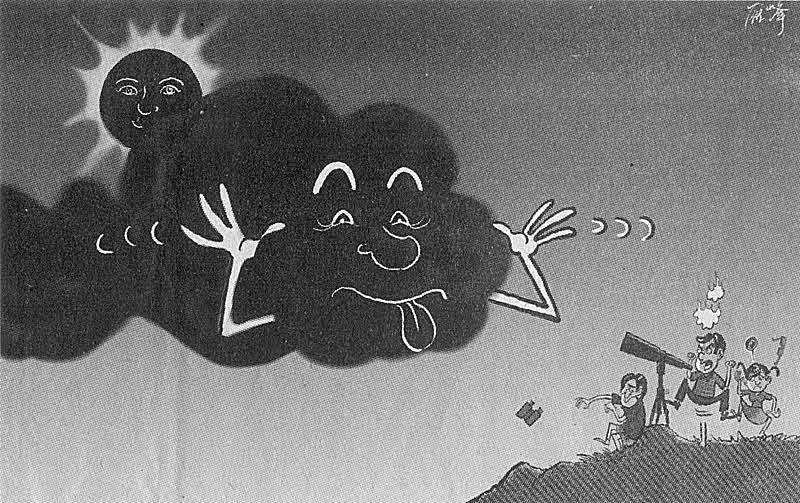 Coincidentally this cartoon appeared in the Chinese Daily newspaper the next day. Our last glimpse of the Sun before 2nd contact. Note the dragonflies. There were thousands of them filling the air. 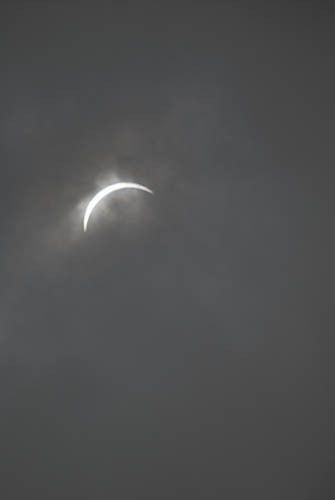 Thick cloud moved in and obscured the sun as the umbra approached. This satellite photo was taken just before totality. Our observing site marked with the arrow. The inset is enlarged below. The part clearings observed from our site 40 mins before C2 may be visible south of site 1. Due to the size of the shadow and the cloud the lighting transition was dramatic and it seemed much darker than other eclipses I've seen where light comes spilling in from the edges of the umbra. The lighting changes on the bridge and surrounds was dramatic. This set of photos below [by Greg Bond, animation by Joe Cali] attempts to illustrate this though the camera's auto exposure system and the difference in perception between photographic recordings and the human eye make this a near impossible task. 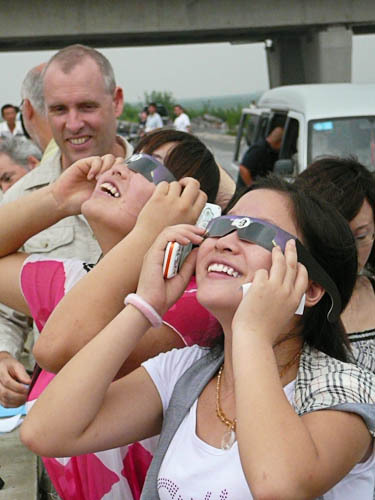 During the eclipse and especialy during totality, locals seemed fascinated by the animation on computers running Eclipse Orchestrator software as seen in this photo by Dan Orange. They actually took photo's of the screen. We got our clearing right on C3. During the eclipse, Bengt walked away from the crowd north east up the footpath. Bengt saw a second or two of totality and the last diamond ring clearly, much better than anyone else. He was approximately 50m north of the rest of us so a small distance can make the difference. But in the end, 1 second of totality doesn't count as an eclipse. We had a lot of fun joking around with about 50 locals who gathered at our location. There was only one other foreign eclipse chaser, Tommy, a Quebecoise. He was using the same car rental company we were. He didn't have a plan of where to go and becasue the two drivers were talking to each other on cell phones, they followed us to our location. 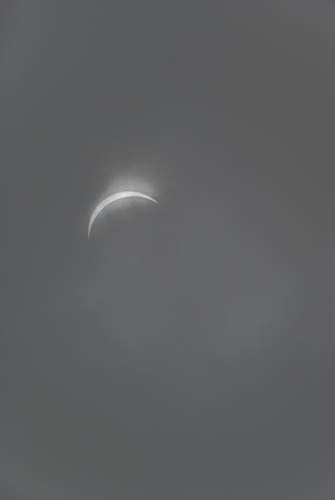 We saw a few minutes of partial phases after C3 then when more cloud came in, we decided to forget about the rest of the partial eclipse and pack up. This was a good call. As soon as we got into the car, a heavy rain shower hit the location so our instincts were right. There were some positives to take away. The landscape where we were located, although a built environment, was simple & spectacular as darkness descended and the quality of the light fascinating. It was like "liquid velvet" softly wrapping itself around everything. Being a "real" photographer, I enjoyed this aspect of "just watching the light" this time but for the first timers in our group, it was bitterly disappointing to miss the big show. My time-lapse camera (35mm film) with fish-eye lens was running and I'm looking forward to seeing those results. It was dark. Around mid-eclipse I counted one exposure when I heard the camera trip. It took perhaps 40s ISO100 f4.5. 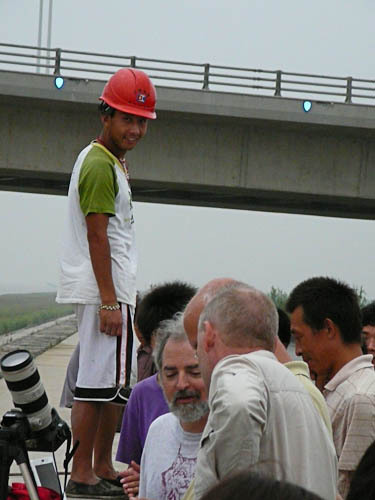 If you were one of the people on buses heading north off Yangshan straight after totality waving to a handful of eclipse chasers with a couple of telescopes just off the north side of the bridge - that was us. It was interesting though sad to watch various members reactions. Dan and Ryo only came for the eclipse so they were quite shattered by the failure. Dan had to leave immediately after the eclipse to go drill for oil ;-) But he was extremely disappointed. Ryo went to ground for 24 hrs after the eclipse. Bengt and I had already spent 2 weeks on the "China for Dummies tour" bumbling around Hangzhou and Suzhou with no language skills and no guide. We'd had a lot of laughs already and still had Guilin to come. We were relatively unaffected. 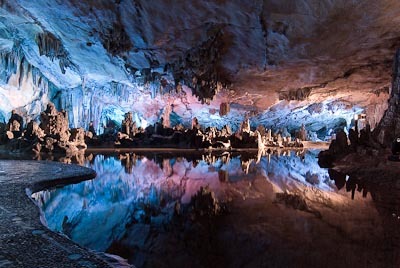 Greg was somewhere in between, he still had the Guilin trp to look forward to. Glad to hear that a few people caught a break and others had complete success. Commiserations to those who, like us, missed out completely. We are now back in Shanghai for 2 days and will head for Guilin Friday pm. 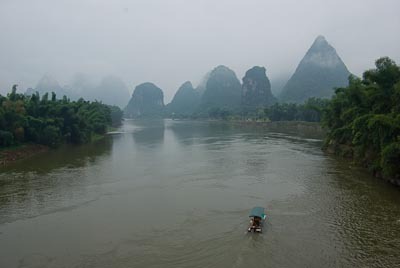 After the eclipse we headed south for a weeks travel around spectacular Guilin.